Register for the Whiskey Tango Foxtrot Trail Half Marathon today! Registration is now closed for the 2019 race. Hope to see you next year! This two loop course shows off some of the great trails (including Foxtrot Trail) at Northeast Park. The course has two river crossings ranging from 6 inches deep if there has been very little rain to 2.5 feet deep with a lot of rain (anything over that height and we have an alternate course). At the finish, we will have some great beer and an awesome finishers medal to show off when people ask you "Whiskey Tango Foxtrot were you thinking racing a trail half marathon that crosses a creek at the end of February?!" This race is race number 1 in the Trivium Medal Series. If you complete all 5 races you will receive a finishers medal as well! All six medals will fit together to make one giant Trivium Medal! New medal design coming for 2018! Additional race information can be found at http://triviumracing.com/event/wtfNC131. Parking will be available in various parking lots around the park, except for the one at the pool. 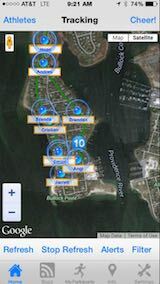 Volunteers will be able to direct you to parking on race day. Awards for top three overall males and females. Check out this comprehensive athlete guide to answer any nagging questions you may have about the race. If you can't find an answer here, shoot us a message below! 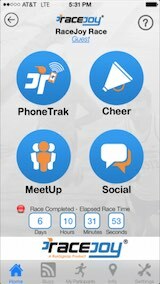 Make sure you download the RaceJoy mobile app for live phone tracking at the Whiskey Tango Foxtrot Trail Half Marathon. The Whiskey Tango Foxtrot Trail Half Marathon is sponsoring RaceJoy to provide participants and spectators these features for free (normally a 99 cents upgrade fee for both the participant and spectator). The Whiskey Tango Foxtrot Trail Half Marathon has a course map available.